Switch ASICs need to monitor buffer pointers and free lists at wire speed -- assuming the switch is wire speed. So information about buffer occupancy is in there somewhere. Packet buffers are used and released far too quickly to be managed by the system processor. The challenge is how to report it. An SNMP-style poll of a gauge that changes slowly like air inlet temperature works fine. But for something that can have important events that begin and end within 100 mS, polling cannot run fast enough. One commonly adopted solution is water mark analysis. The switch is programmed with a threshold. When buffer occupancy exceeds the threshold (aka water mark) a report is generated. When the water goes back down, another report is generated. Or perhaps there are two thresholds to provide some hysteresis and avoid chattering when the water bumps above and below the mark at high speed. Another approach is for the switch to stream buffer info directly to a collection system without a poll/response cycle. This is the same approach adopted by S-flow. Cisco does it differently in their Nexus 3500. As the market leader, Cisco works to differentiate from the crowd of ankle biters that would help Cisco with their lunch. One way they do this is to sing the praises of custom ASICs, most recently in a blog. A lot has been written about this. It amounts to a rat race with ever increasing costs against merchant silicon competitors that show ever increasing capabilities. The link to Cisco's blog should not be read as an endorsement of its contents. One of the areas where Cisco has applied custom technology is buffer queue monitoring. This has been covered here in the write up on the 3548. The particular approach used by Cisco requires tight integration between the switch ASIC and the control processor. The approach is not friendly to a disaggregated system where hardware and software meet at an API. Arista with their lanz latency analyser program lead the way to commercial availability of buffer occupancy reports. Arista proudly proclaims that all their products run the same EOS switch software. If the implication is that they all have the same capabilities, well, not so much. The EOS software running on the control processor can only expose features that were placed in the switch silicon when it was manufactured. The stuff that Cisco [ Nexus 3548], Arista [7150S] and Broadcom [Trident-2 and later] put into their silicon are unlikely to be the same. Arista actually claims that LANZ buffer reporting is available on four switch systems: Intel FM6000, Broadcom Trident II, Broadcom Dune and Cavium Xpliant. 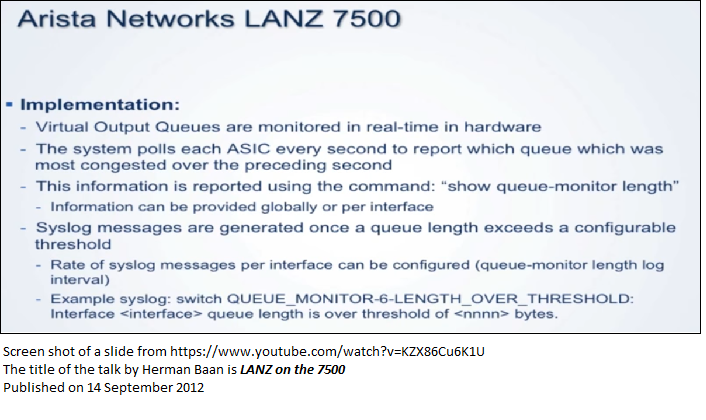 The original description of LANZ was written in 2013 when the FM6000 was the only switch silicon supporting granular buffer reporting. This unique event driven model, allows congestion periods as short as a few 100ns to be detected and reported. The report goes on to claim that the only limitation on latency measurement is that switch accounting is done by counting allocated 480 byte buffer blocks. The last block of each packet might be full or it might contain only a single byte. The uncertainty depends on the line speed; at 1 Gb/s it amounts to 4 uSec. Arista has pointed out, a shared memory switch like the FM6000 based 7150S deals with buffers in a different way than a Broadcom DUNE switch that queues packets on its input ports. What this says is that the switch system processor reads buffer stats from the switch chip every second. I was told on a trade show floor that the buffer state represents the peak value during the interval between reads and it is cleared after each read. Water mark events are detected at the system processor level and report generation follows. Peak latching will catch microbursts. It will not give detailed information about their shape. An that is probably OK.
Broadcom introduced Buffer Statistics Tracking (BST) in March 2015 about 2 years after the LANZ paper. The feature first appeared for the Trident-II and is available in subsequent XGS products (Trident-II+, Tomahawk) as well as the most recent Dune products (Jericho and Qumran). When equipment manufacturers use Broadcom ASICs, they use the BST feature set to access buffer data. There simply is no other way to get buffer data. BST is part of Broadview that includes other monitoring and debug features. At announcement in June 2015, I was told that fine grain monitoring was in the silicon and accessible via the SDK. But Mellanox had not integrated access into their software. Fast forward to March 2017: "It took a while, but we're there now." And in a Cumulus webinar a week later, fine grain monitoring was demonstrated -- using Cumulus Linux. So, it is real. David Iles from Mellanox pointed out that Mellanox has histograms for buffer occupancy bins while Broadcom shows a single peak occupancy for each port in each measurement interval. Iles says that Mellanox is better than Broadcom. This example was part of a webinar on March 14, 2017. It shows access to watermark data in a switch running cumulus linux. Here we are looking at the results of two simultaneous 10 second iperf tests that passed through this port. The high waternark values were cleared ahead of the run. The units are buffer particles. Particle size for Mellanox Spectrum ASICs is 96 bytes.